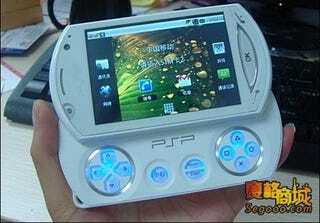 It says a lot about how hideous Sony's rumoured PlayStation Phone prototype is that a Chinese knock-off using the PSPgo as a template is a more desirable piece of hardware. Unmei Q5 doesn't just look like the PSPgo, its external case essentially is a PSPgo, down to the illegally-used logo, d-pad and face buttons. The difference between the two systems - aside from the Q5 being a phone - comes on the top screen, which unlike Sony's most recent handheld sports a 3.5 inch touchscreen. The Q5 also has both front and rear cameras, SIM card slots, a mini-USB port and even a built-in Nintendo Entertainment System emulator, all for around $60. Sony's PlayStation Phone, whatever it ends up looking like, is going to have to work hard to beat a deal like that!